What’s the average CPA salary? CPA salary data from the Department of Labor shows that the average accountant’s salary in the U.S. is $69,350—and if you hold the CPA certification, you are likely to make 10-15% more than a non-CPA. Our report discusses factors that will affect your earnings as a CPA. 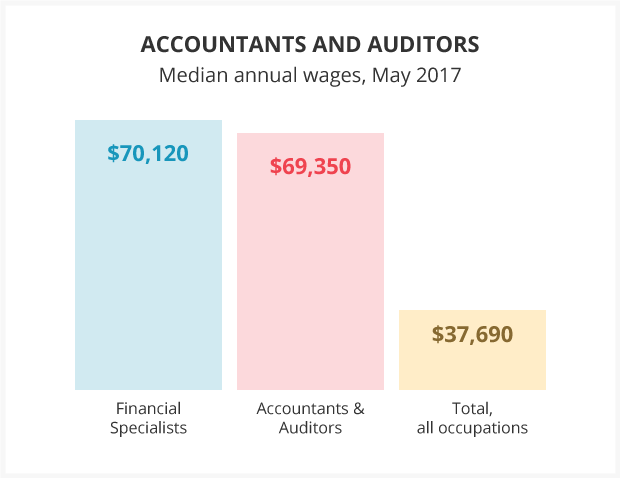 According to the Bureau of Labor Statistics, the median annual accountant salary in the U.S. as of May 2017 (the most recent data available) was $69,350. The lowest 10% of accountants earned less than $43,020, and the highest 10% earned more than $122,220. Unfortunately, the Department of Labor does not distinguish between accountants with a CPA certification and those without. It also does not make any distinction between the many specific on-the-job titles an accountant might hold, and it does not include self-employed income. Further, its reports do not reveal the differences between entry-level accountants and those with years of experience. So we’ve compiled information here to help make those distinctions. Let’s break down each of the four categories listed above so you know how to apply them to your circumstances. If you are applying to your first accounting job, your experience is reflected in the quality of your school, your grades, the relative prestige of the internships you’ve completed, and any relevant extracurricular activities. The average salary for an entry-level CPA is about $56,000, but the entry-level CPA salary range spans from $45,000 to $75,000 depending on where you live and work. Once you get that first job, experience starts to include actual time working in the industry, accomplishments that accompany the role(s) you’ve performed, and so forth. 0-1 years (Entry-level accountant) – Getting that first year of experience is a major accomplishment. It’s a whirlwind, and you’ll learn a lot during this time. You’ll be exposed to a lot of information, and you might start getting an idea of which direction to take your career. 1-3 years (Junior accountant) – During the next few years you can expect to gain more responsibilities and duties, particularly in the areas in which you show inclination or expertise. Note: Most states require at least two years of public accounting experience before a candidate is eligible to become a CPA. At the junior accountant stage, you may become certified or may be preparing to become certified. 4-6 years (Senior accountant) – Most accountants have chosen their career path by this point, and your job title will probably soon reflect your specialty. 6+ years – After you’ve occupied a senior role for a few years, the number of years you’ve worked takes a back seat to more specific experience, namely your accomplishments and accolades. To achieve a management or director position, you have to distinguish yourself. Not everyone gets to occupy the top spot on the ladder. We get a more complete picture of who earns what level of salary when we combine the information from the Bureau of Labor Statistics with other sources, most notably the Robert Half 2019 Salary Guide. This range includes candidates who have a less-than-average amount of experience, require skill development, and who may be working in an industry with low competition for talent or in a smaller, less complex organization or department. This range includes candidates who have an average amount of experience, have the necessary skills to meet job requirements, and whose role may be of average complexity or in an industry where competition for talent is moderate. This range includes candidates who have a higher-than-average amount of experience, have a strong skill set compared to most of their peers, and who may occupy a fairly complex role or work in a competitive field or location. This range includes candidates who have more experience than almost all of their peers, have among the highest level of expertise and/or certification(s), and whose role may be highly complex or exist within a highly competitive realm. As with almost all professions, the complexity of an accountant’s role, as well as their experience level, is going to have a great influence on expected salary. Generally, the amount of experience you have is the single most important factor when determining your salary as an accountant. Consider, however, the most highly specialized accountant probably isn’t going to be earning in the 95th percentile if he or she is working in a smaller, less complex organization. At the same time, there exist some larger, more complex firms that pay their entry-level CPAs more than smaller firms pay junior CPAs. According to the Robert Half Salary Guide, the CPA is one of the top certifications that can give you a nudge toward the upper 95th percentile. As a result of this, even new CPAs usually fall between the 50th and 75th percentile. It’s relevant to note that accountants in management and directorship positions are overwhelmingly those who hold the CPA license. In fact, for many senior positions, the CPA or a comparable certification is among the minimum requirements. There are a few more factors to consider when determining or projecting a CPA salary. Even though location is actually the next most important item on our list when discussing CPA earnings, we’re going to discuss that factor closer to the end because it’s relatively easy to figure out how location will affect your salary. The first big decision a new accountant makes is whether to go into public accounting or private accounting (also called “corporate” or “management” accounting). Despite what the title implies, a Certified Public Accountant can be found working in either sphere. Both public and private accountants are well-compensated, and the Department of Labor projects job growth in both fields to be steady (~10% through 2026). That said, public accountants tend to make slightly more income than their private peers in comparable roles. And remember, Certified Public Accountants also tend to make about 10-15% more than non-certified accountants. Presently, an entry-level public accountant can expect to make about $53,263 per year. It’s important to do your research on the different public accounting paths and the different types of firms so that you can find the perfect fit for your desired lifestyle. Bottom Line: Public accounting is the fastest way to advance your accounting career (and your salary), but it will also be the most demanding. Presently, an entry-level private accountant can expect to make about $51,188 per year. When working in private industry (performing accounting work for a company), there are dozens of different positions available to you. Bottom Line: Going from college into private industry is a good option for many students. The drawbacks are that career advancement and salary increases take much longer. On the plus side, these jobs are much less demanding than public accounting. Learn more about our review courses for the CPA, CMA, and CIA designations. As industry affects CPA earnings, so does company size. Large firms are willing and able to pay a premium to attract top talent. The more employees and assets a firm has or the more clients they service, the more complex various accounting functions become, and accountants’ salaries reflect that. Generally speaking, the larger the company, the higher the pay for a given role, and the better defined your career path will be. The Big 4 accounting firms are good examples of public accounting firms where an entry-level CPA could expect to make a higher-than-average starting salary. Larger firms tend to offer some benefits (e.g., gyms, cafeterias, and daycare) that smaller firms can’t reasonably fit into their budgets. Smaller firms are usually more flexible and offer greater access to management, so individuals have greater say in the perks and fringe benefits available. It’s really a personal choice when you decide which industry and what size company you want to work for, but you need to account for benefits that can affect your quality of life. For example, daycare can be a considerable expense for young working families, and an on-site daycare could save thousands of dollars and dozens of hours in commuting each year. At the same time, some people dislike the bureaucracy that comes with larger organizations, and they’re happier at the end of the day if they have more leeway to pursue their own ideas. According to the 2019 Robert Half Salary Guide, hiring trends in accounting and finance continue to favor the job candidate. The guide reported that firms across industries are increasing compensation and “Skilled accounting and finance talent is in short supply, and top candidates frequently field multiple job offers.” Some companies are offering bigger bonuses, more perks, and additional vacation time in order to attract recent college graduates with accounting degrees. This is a great time to go into accounting, and the CPA will help you land an even bigger starting salary than you could without it. Even though technology is steadily revolutionizing the job market, many companies from all kinds of industries continue to rely on experienced financial staff to handle their accounts, and as a CPA, you may be selected for high-level positions with even higher compensation. In general, the bigger the city, the higher the median salary for a CPA. There’s more competition, more opportunity, more capital in cities, and a rising tide lifts all ships. That said, the cost of living is higher in metropolitan areas, some more so than others, so location isn’t everything. If you dislike the cold and aren’t comfortable in a big city, you don’t have to live in New York or Chicago. Accountants are generally well-compensated, so it is advisable to first find a place you want to live or a firm you want to work for and then allow the adjustments in the table below to inform your salary expectations. Let us take a look at the estimated salaries for general private accounting work. All estimates are based on the most recently available data. Remember, CPAs can expect to earn 10-15% more on average than non-CPAs. In addition to increased salary potential, the CPA credential can increase your total earnings and provide several other benefits that will strengthen your accounting career. The financial rewards of the CPA credential start out great and get better over time. Many companies incentivize employees to pass the CPA Exam by offering a completion bonus of several thousand dollars. CPAs can earn frequent and higher-level promotions. These promotions come with higher salary, increased authority and responsibility, and excellent experience. With many Baby Boomers retiring and the Sarbanes-Oxley Act enforcing higher standards for public corporate accounting, there is currently a shortage of experienced accounting professionals. Businesses, nonprofits, and governments will always need accounting services, and computers won’t be able to replace experienced CPAs any time soon. Therefore, the CPA credential offers a higher level of job security to accountants during a period of otherwise uncertainty. Certified professional accountants have various employment options. Choosing public accounting as a career path places you in accounting firms that provide services to other businesses or governments, while private accounting involves working for a company directly in their accounting department. As we noted above, the range of job roles in either of these industries is vast, and CPAs are in demand in locations around the world. Whether you work in the area of financial accounting and reporting, management accounting, treasury or cash management, or financial analysis for a local accounting practice or an international firm, you’ll have a lot of options as a CPA. The purpose of the CPA Exam is to assess your professional competence in auditing, business law and concepts, taxation, and accounting. So, passing the CPA Exam proves that you are completely capable of performing the primary tasks of a CPA in today’s accounting industry. Maintaining your certification will also require continuing your education and constantly updating your skill set. The dedication required to pass the CPA Exam demonstrates to employers that you are committed to the profession and worthy of consideration for leadership and management positions. Becoming a CPA involves a level of concentration and work ethic that permanently sets accountants apart from their peers. The title also empowers CPAs to develop exceptional expertise and accomplishment through years of training that impresses employers, clients, and society. CPAs are an exclusive professional group that earn the admiration of most everyone in the industry for their reliability and efficiency. These benefits of becoming a CPA clearly indicate that getting your CPA credential is one of the best career decisions you can make as an accountant or accounting student. Your salary package will vary depending on the type of accounting you choose, the field or industry you work in, your location, and your experience level. By choosing wisely for yourself, you can enjoy a satisfying and prosperous career as a CPA.